east, which is about 780 km east of Willis Island and 1240 km east of Cairns. further as atmospheric conditions become increasingly unfavourable. Interesting track map. Livio Regano said it went Cat 2 last night. Looks almost completely wiped out on the sat image now. Now Ex-Tropical Cyclone Owen. Maybe some rain later in the week if it comes west. Looks like what is left of the LLC has started it's trek towards the West on the visible sat image. E's not blowin'! 'E's passed on! This cyclone is no more! He has ceased to be! 'E's expired and gone to meet 'is maker! 'E's a stiff! Bereft of wind, 'e rests in peace! If you hadn't nailed 'im to the track map 'e'd be pushing up the daisies! 'Is metereological processes are now 'istory! 'E's off the twig! 'E's kicked the bucket, 'e's shuffled off 'is mortal coil, run down the curtain and joined the bleedin' choir invisible!! THIS IS AN EX-CYCLONE! with the movement of the system." which is about 530 km east of Willis Island and 990 km east of Cairns. with the movement of the system. will we have TC Owen #2? GFS is keen, crossing Innisfail to Cardwel, will see how the afternoon model runs go. upper trough helping with that convection, which obviously could assist in the system deepening. BOM showing no signs of interest at this stage, but its got to be in their minds. None the less, with heavy rain and strong winds expect a Severe Weather Warning for at least central regions this weekend. for the period until midnight EST Monday 10 December 2018. 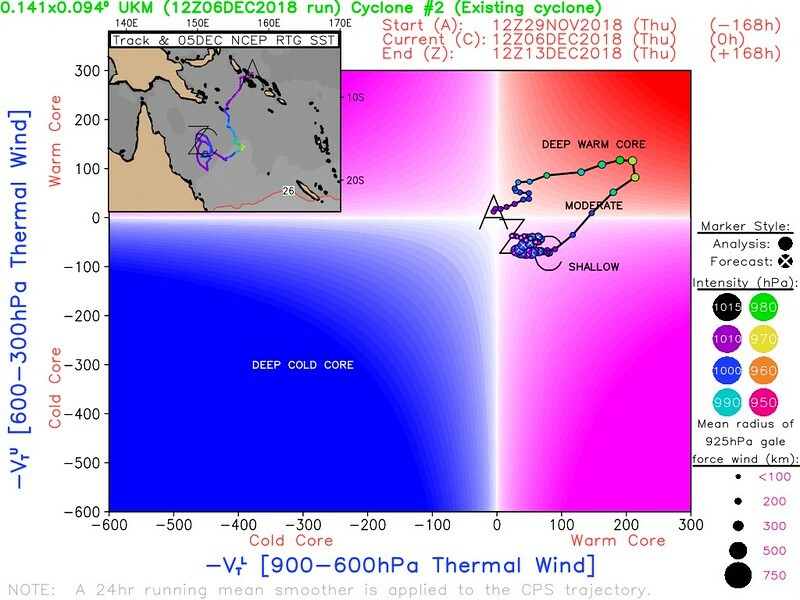 At 2pm AEST Friday, ex-tropical cyclone Owen was located over the Coral Sea near latitude 15.8 degrees south, longitude 151.0 degrees east, about 580 kilometres east-northeast of Cairns. This system is not expected to redevelop into a tropical cyclone, but may approach the Queensland coast over the weekend and produce strong winds and heavy rainfall about the Central Coast and adjacent districts. Another tropical low was located east of the Eastern Region near latitude 15.8 degrees south, longitude 162.6 east. This system may move westwards into the far east of the Eastern Region on the weekend, but is not expected to develop into a tropical cyclone. I'm just transferring it to the relevant thread. How did it reemerge as TC out of nowhere, HWRF-P is showing it as well, making Landfall between Innisfail and Mission Beach. Also is there any difference between HWRF and HWRF-P other than it being displayed on a bigger map. It didn't really emerge as a TC out of nowhere - some models such as EC have been predicting that it'll re-intensify by around this time so not really a big surprise. It's also not a TC either (at time of writing this)... although the convection looks good on satpics, you can see it's significantly displaced out towards the system's southeast due to the current shear (you can see the upper level northwesterlies streaming the cloud away to the SE) rather than being more symmetrical as is normally the case for actual TC's in a low shear environment. The area of strongest winds is also currently asymmetrical (as opposed to more symmetrical for TC's) and mainly confined to its southern and southwestern side where the pressure gradient between ex-Owen and the big Tasman Sea high and associated ridge has helped to strengthen the winds there. As for the HWRF-P, I'm not 100% sure but it could be tropicaltidbits' own term for the HWRF's parent (bigger) domain in which the smaller HWRF domains nested inside it, float around as they track tropical systems. 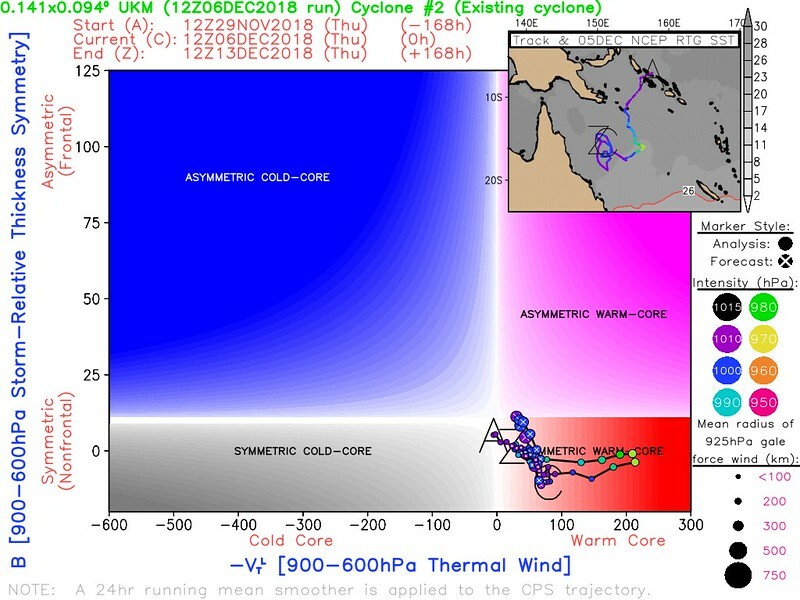 Having said that, the forecast phase diagrams from some of the models do suggest that it may take on increasingly TC-like characteristics for a short time as it continues its journey - see above example from the UK model (C = current position). Could Owen make a comeback briefly? 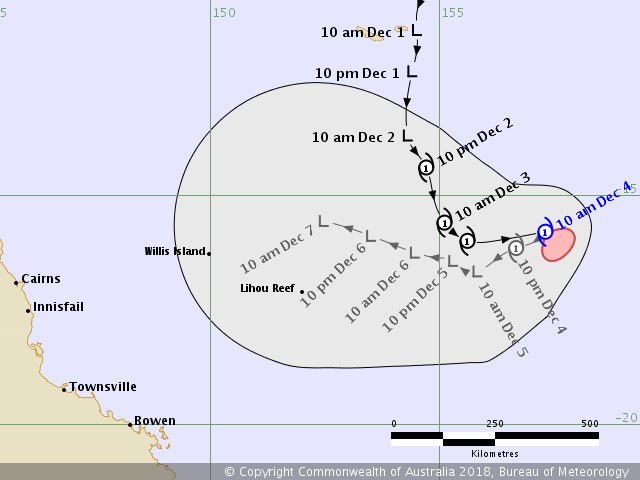 Because the Bureau’s TCWC currently doesn’t anticipate that it’ll become a tropical cyclone again. That's enough to blow down anything that hasn't been burned down here. New pockets of rainforest exposed to gale winds is enough. modelling this afternoon looks to put a cat 1 on the coast in 24 hours. Jessussssss. Hope they update the SWW shortly to accommodate damaging winds. CIRCULATION CENTER (LLCC) WITH DEEP CONVECTION SHEARED TO THE SOUTH. Maybe in time shear will improve.....? Generated in 0.030 seconds in which 0.005 seconds were spent on a total of 13 queries. Zlib compression disabled.